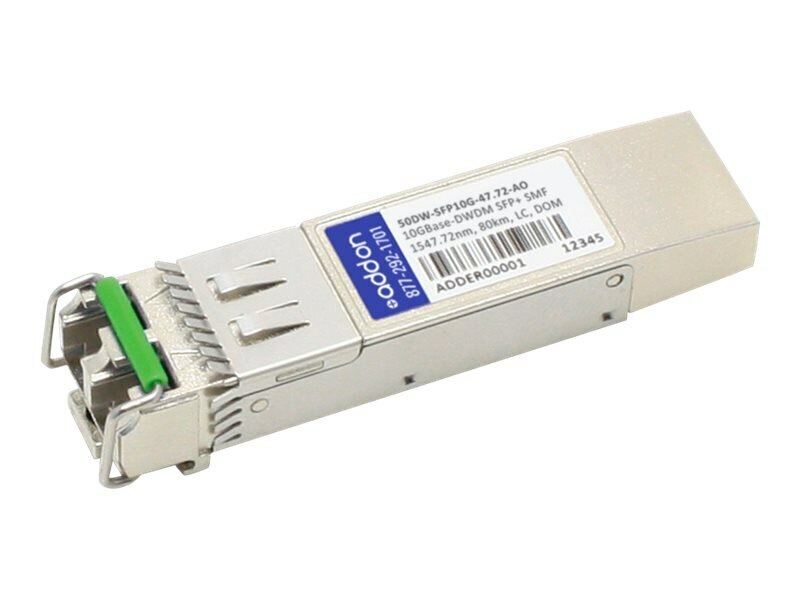 This Cisco DWDM-SFP10G-C compatible SFP+ transceiver provides 10GBase-DWDM 50GHz throughput up to 80km over single-mode fiber (SMF) at the wavelength specified between 1530nm and 1560nm using a LC connector. Digital optical monitoring (DOM) support is also present to allow access to real-time operating parameters. The transceiver is guaranteed to be 100% compatible with the equivalent Cisco transceiver. This easy to install, hot swappable transceiver has been programmed, uniquely serialized and data-traffic and application tested to ensure that it will initialize and perform identically. It is built to meet or exceed the specifications of Cisco, as well as to comply with multi-source agreement (MSA) standards to ensure seamless network integration. Trade Agreements Act (TAA) versions of this part are available upon request.